Recently I was meeting up with the Barons at The Brockway Pub in Carmel to blow off some steam after work. Talking about beer and having a moment to try something new is always a great way to get one's mind off of a hard days work. I had been toying with an idea to put together a post on a head-to-head BIPA post. The concept was to take all the local breweries BIPAs and have a Barons tasting session to decide the "winner." With this in mind, I saw that DB's BIPA was on tap. I had tried Danny Boy's Training Day American Pale Ale previously, which was a solid 3 in my book. I thought to try something by them again to add to the list of contestants, hoping to be pleasantly surprised. I wasn't. For those of you playing the home game, the term "Black IPA" is a figment of your imagination, just forget this term ever exists for a moment. Tracking back to the Brewers Associations 2013 Beer Style Guidelines there is nothing called a Black IPA, however there is something called an American-Style Black Ale. The term is "official" for what everyone calls Black IPA. Under this definition it states that "American-style black ales are very dark to black. The perception of caramel malt and dark roasted malt flavor and aroma is at a medium level. High astringency and high degree of burnt roast malt character should be absent. Hop bitterness is perceived to be medium-high to high. Hop flavor and aroma is medium-high. Fruity, floral and herbal character from hops of all origins may contribute character. American-style black ale has medium body." Official definition... Check. What was awaiting me in my glass was more akin to what another acquaintance of mine summed up best as "a good coffee porter." Skip this section if you want to avoid the Rocky Fight scene... You've been warned. At one point all three Barons were attempting to drink their own pint. You all know how that goes, "This is terrible... HERE! You order it and try it!" I distinctly remember downing over half a glass just to make sure that I was being objective in my review. Yet when the waiter arrived later to see how we liked it my beer was "magically" full again... Not having the stomach to take down a full pint and then some I asked him to take it back and get me something else. In all my history of drinking I have never once asked to return a beer in exchange for something else. Even after having a terrible experience with Count Hopula DIPA at Barely Island (I gave it a .5) I just paid for the beer and left it half full on the bar after choking down the first half. I chalk that one up to having the tail end of a batch that was left on for too long. Please note that this should never happen at a bar. Servers/bar tenders need to know when to drag a keg out back and shoot it before it has reached this point. I hope this to be the same case with DB's BIPA. I may give it a second chance, but that rematch will not be happening anytime soon. The Big Guy: On this point I have to agree with O-Dawg. I have had some great Black IPA's lately like Nunmore and In the Name of Suffering. This one wasn't even in the same game. It was a fine dark ale of some sort, but I felt like it never tried to take a beer identity. It wasn't malty enough to be a stout, it was a pretty boring porter and there certainly wasn't enough hops for it to be an American Black Ale. Sometimes brewers try and make a beer appeal to the masses by toning down what makes it special. I think this is one of those cases where it has been toned so far down that we can't even tell what it was supposed to be. 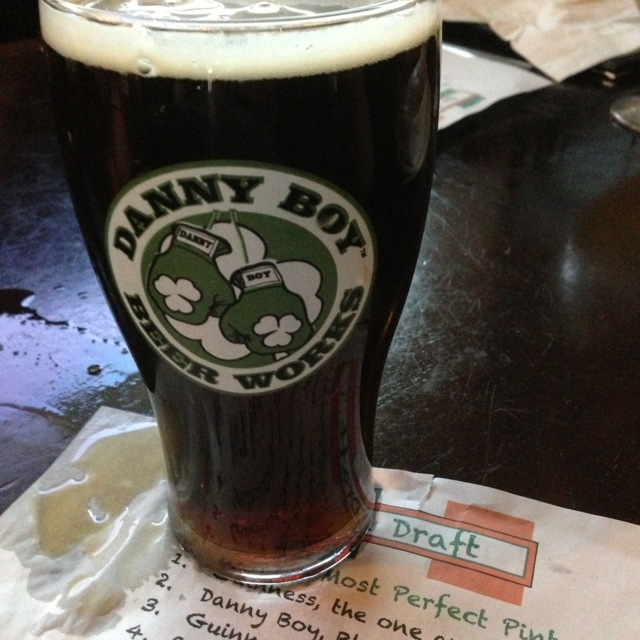 Although I am sure Danny Boy can brew something exciting and innovative, it was not this. I give it a one and a half, since I didn't send mine back.